The Royal Society of Edinburgh and the Young Academy of Scotland warmly invite you to Nursing stories from the First World War: A conversation with Dr Diane Atkinson. Author Dr Diane Atkinson will share excerpts from and answer questions about her book ‘Elsie and Mairi Go To War: Two Extraordinary Women on the Western Front.’ Dr Alison O’Donnell, nursing historian and member of the Royal College of Nursing History of Nursing Society, will chair the conversation. The event will be accompanied by a small public exhibit to commemorate the centenary of the end of the war (open 5th – 16th November 2018). ‘Elsie and Mairi Go To War’ charts the journey of a young Scottish woman, Mairi Chisholm, and her English friend, Elsie Knocker, who volunteered to work as nurses on the front lines of the war in Belgium. Known as the ‘Madonnas of Pervyse’ they treated thousands of wounded soldiers over four years and were awarded numerous medals for bravery. A statue commemorating the courage and commitment of these two British nurses now stands in Ypres, Belgium. Open to all and free to attend − registration required. For further information or to book, please visit the RSE website or contact the RSE Events Team at events@therse.org.uk or on 0131 240 2780. This free event will explore how digital technologies and infrastructure help enable innovative co-creation and co-research with communities and can build new communities of learning, shared knowledge and creativity. The event contributors include researchers, community groups and representatives, artists, and commercial partners who have worked with the Digital Transformations and/or Connected Communities Themes over the course of their development. The two-day event will include a range of activities including talks, presentations, workshops, performances, networking and exhibition elements. How do we use the digital to support new forms of collaboration and co-creation and to create more inclusive forums of knowledge production? Speakers will include: Keri Facer (University of Bristol); Jon Rogers (Mozilla Foundation); Richard Clay (Newcastle University);Ming Lim (University of Liverpool Management School). Short screening of films created by Michele Aaron and Bryony Campbell as part of the AHRC-funded Life:Moving project, a collaboration between researchers at the University of Birmingham and the John Taylor Hospice. The Connected Communities Theme will launch the Foundation Series, 8 reviews exploring the different theoretical and methodological foundations of collaborative research. The reviews will be available to view at the event and download online afterwards. How far and in what ways is our digital world reinforcing existing elites and hierarchies? How far is it a potential vehicle for change and resistance? Speakers will include: Natalia Cecire (University of Sussex);Nelson Mundell (University of Glasgow); Tim Hitchcock (University of Sussex). How can digital environments help us to reconceptualise disability, illness and accessibility? How can processes of co-creation prioritise the experiences and insights of people with illnesses and/or disabilities? Speakers will include: Michele Aaron (University of Warwick); Martin Levinson (Bath Spa University); Jayne Wallace (Northumbria University). How can digital environments promote co-creation and collaborative methods in research and what represents best practice? What have we learnt from trying to build connected communities? Speakers will include: Hannah Wright (Glasgow Women’s Library);Chiara Bonacchi (University of Stirling); Mike Wilson (Loughborough University). How are digital environments fostering the re-evaluation of the nature of the archive and encouraging different communities to create new types of archive? How can creating archives challenge existing power structures and enhance community identity? Attendance is free, but places are limited – please register via the Eventbrite page. The Anatomical Collections of Edinburgh University are immense and varied, gathered over more than five centuries. They vary from anthropological specimens from the colonial era, to early-modern curiosities such as human horns alongside narwhal horns. There are roomfuls of animal specimens, collected in an attempt to conjure order from the commotion of life. There’s the skull of George Buchanan and the skeleton of William Burke. Gavin Francis isn’t a curator, but a doctor and writer who has found inspiration in the collection. His illustrated lecture will be a personal journey around some of the highlights of the collection. Gavin Francis practices medicine in Edinburgh and is the author of three books True North, Travels in Arctic Europe (2008, 2010), Empire Antarctica, Ice, Silence & Emperor Penguins(2012) which was Scottish Book of the Year 2013 and shortlisted for the Costa, Ondaatje, Banff, & Saltire Prizes, and Adventures in Human Being (2015), which won Saltire Non-Fiction Book of the Year 2015, was the Observer’s Science Book of the Year, and was a winner in the BMA Book Awards. His fourth book Shapeshifters: A journey through the changing human body will be published in 2018. More on Gavin’s writings (including further essays) and work can be found on his website. All welcome! If you are interested in attending this lecture, please reserve your free ticket via the Eventbrite page. Screen Seminars at Glasgow are delighted that Dr Hannah Hamad (University of Cardiff) will be presenting her work on ‘Screening the NHS at 70: Exploring the Political Stakes of Contemporary UK Medical Television’. All welcome! In 2018 the NHS is seventy years old. 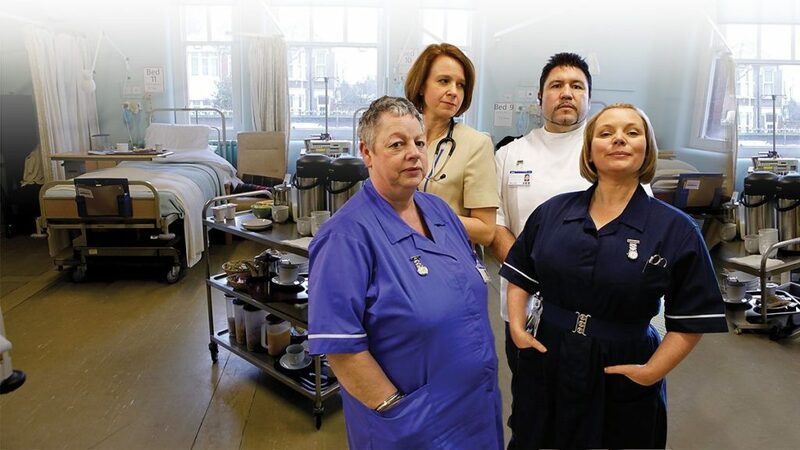 So far the BBC’s most noteworthy gesture towards this has been the nostalgic, reverential and celebrity-oriented television documentary series Matron, Medicine and Me: 70 Years of the NHS (BBC, 2016). The media, including television, have always played a crucial and high-stakes role in making the organisation and its services knowable to the British public, and in negotiating its wavering status as the most seemingly immovable bastion of the UK welfare state. Since its beginnings, the media have functioned as a mouthpiece for government policy and agendas on the National Health Service. But since the immensely controversial passing and implementation of the Health and Social Care Act of 2012, critics like Oliver Huitson have lambasted the news media in particular for their perceived complicity in enabling this to take place with relatively little outcry from either the public or the commentariat. However, as I argue and explicate in this talk, niche outlets and platforms on UK television, even within the mainstream media (e.g. BBC Four’s observational mockumentary sitcom Getting On), have provided audiences and users of the health service with differently oppositional and counter-hegemonic positions on readings and depictions of the NHS under neoliberalism. Dr Hannah Hamad is Senior Lecturer in Media and Communication at Cardiff University and the author of Postfeminism and Paternity in Contemporary US Film: Framing Fatherhood (New York and London: Routledge, 2013). The Life of Breath Project is pleased to announce ‘Arts of Breath’, a series of lecture-performances exploring the role of breath in poetry, fiction, singing, dance and visual art. All events will take place in Durham. For more information see individual event pages below, or contact Sarah McLusky. The programme launches on Wed 15 November with Prof David Fuller examining Charles Olson’s breath-related theories of poetic structure and how these ideas were taken up by other poets, including William Carlos Williams. To celebrate the launch, this first event will be followed by a drinks reception, which all attendees are welcome to attend. The Centre for the History of Medicine (part of the Institute of Health and Wellbeing at Glasgow University) and the Royal College of Physicians and Surgeons of Glasgow invite you to a series of free seminars on medical history. Booking: email library@rcpsg.ac.uk or call 0141 221 6072. This event is free but please contact us to book as places are limited. The Centre of the Social History of Health and Healthcare (CSHHH) invites you to their annual lecture, by Wendy Kline (Purdue University), on ‘Making the Invisible Visible: The Unexpected Entanglements of Psychiatry, Midwifery, and Psychedelics’. All are welcome, but please reserve a place by emailing caroline.marley@strath.ac.uk as soon as possible. The timing was fortuitous, for Grof was in the midst of an existential crisis. Like many psychiatrists in Europe and the U.S. in the 1950s, he was inspired by Freudian analysis. Psychoanalysis was brilliant in theory, he believed, but abysmal in practice. It lacked visible proof of efficacy, a reminder of the profession’s struggle for legitimacy. Over the next fifteen years, Grof set out to provide that proof. He established himself as the world’s foremost researcher of psychedelics, conducting over 2000 psychedelic sessions first at the Maryland Psychiatric Research Institute and then at the Esalen Institute in CA. In this talk, I draw on the records of the Maryland Psychiatric Research Center LSD Training Program Study and the papers of Grof to explore the “unexpected entanglements” between psychiatry, midwifery, and psychedelics. Grof observed “astounding parallels” between psychedelic experiences and the clinical stages of delivery, believing that the common denominator between the two was the trauma of birth. He proposed a “new cartography of the human psyche” grounded in this observation, calling it the Basic Perinatal Matrices (BPM.) Despite the fact that Psychologist Abraham Maslow declared Grof’s framework “the most important contribution to personality theory in several decades,” its influence has been largely ignored by medical historians. Wendy Kline is professor and Dema G. Seelye Chair in the History of Medicine in the Department of History at Purdue University. She is the author of several articles and three books (one forthcoming) that focus on controversies surrounding women’s reproductive health. She received her Ph.D. in history from the University of California, Davis, in 1998. Her first book, Building a Better Race: Gender, Sexuality, and Eugenics from the Turn of the Century to the Baby Boom (University of California Press, 2001), emphasizes the American eugenic movement’s interaction with popular notions of gender and morality during the first half of the twentieth century. Her second book, Bodies of Knowledge: Sexuality, Reproduction, and Women’s Health in the Second Wave (University of Chicago Press, 2010) reveals the ways in which women challenged, expanded, and reinvented constructions of the female body and particular reproductive health in the late twentieth century. Her current book project, under contract with Oxford University Press, is entitled Coming Home: Medicine, Midwives, and the Transformation of Birth in Late-Twentieth-Century America. Based on interviews and archival records of midwives, doctors, and health organizations, this book will be the first in-depth, historical analysis of the home birth movement in the U.S. The Royal College of Physicians and Surgeons of Glasgow is delighted to invite you to their annual Goodall Lecture. The Goodall Lecture this year is inspired by the 150th anniversary of Joseph Lister’s article in the Lancet announcing the arrival of antiseptic surgery – a major breakthrough in medical science. This breakthrough was of course achieved in Glasgow, so it is fitting that the lecture is part of the Glasgow Science Festival 2017. Setting the context of Lister’s 1867 article is Mr David Hamilton, transplant surgeon and medical historian, author of the classic text The Healers: a History of Medicine in Scotland. CPD – This lecture has 2 non-clinical credits. To book a free ticket please contact library@rcpsg.ac.uk, call 0141 221 6072 or go to rcp.sg/GS2017. Drawing on Laura’s philosophical training experience with the Venice Board of Medical Practitioners, this seminar explores the calling for a nursing career, stressing the motivational role played by affectivity within the establishment of an authentic empathic relationship with the suffering of the patients. Affective ability should be nurtured in order to sustain the practitioners’ affective commitment, which may be put at risk by every day difficulties at work. Ambulance crews play an integral role in frontline emergency care, assessing, managing, treating and transporting the public with an extensive range of conditions. In attending critical incidents, ambulance crews have to manage the emotions of their patients, relatives and potential bystanders, in addition to their own and those of their crew mate. This seminar focuses on the implications of mobile care work to crews emotional well-being, and will illuminate how the haunted mind affects the delivery of patient care on the road. Anticipations on what new technology will do often range between grand promises, or terrible nightmares. For health care, there is the promise that technology will lead to efficiency, self-management and quality. The nightmare is that technology will make care inhumane, placing screens, beeps or numbers between caregivers and patients. Jeanette will talk about the creative ways in which caregivers and patients relate to technology, and through technology to one another. To reserve your place please email: crfr.events@ed.ac.uk. For further details go to www.crfr.ac.uk/eventsandtraining/training/seminars/. It is our great pleasure to invite you to the 2017 Stone Lecture on Tuesday 21st February, during which broadcaster and writer Sally Magnusson will talk about the challenge of dementia. She will explore how the experience of looking after her mother Mamie (chronicled in her bestselling memoir Where Memories Go) encouraged her to find ways of persuading society to look differently at dementia, and how her mother’s response to music led to the foundation of the charity Playlist for Life. The late Sir Alexander Stone was a prominent member of the Jewish community in Glasgow, and a benefactor to the University. In addition, he endowed lectureships in Bibliophily and Rhetoric.